So you are an Apple freak but you do admit that our macbooks have a really weak wifi connectivity. You must have also purchased one of the best USB wifi adapters, the Alfa AWUS036H and find out that it is not compatible with Snow Leopard or later... Worry not, today I have managed to install this Wifi interface and I am really enjoying it's massive signal boost. I will teach you how I did it. Download the Realtek 8187L from Alfa website or your CD media. Note that the driver must be for OSX 10.5 or later. Plug in the Alfa USB wifi device. A network window shall pop up where you configure a new profile or connect to an existing wifi hotspot. You have now configured your Alfa USB wifi adapter! Note that each time you reboot the computer, you need to repeat step 8. Since the netgear WG111V2 has the same chipset does the same work for the netgear card as it does the alfa card or is it specific to the alfa card. I dont see why it shouldn't work? Hi Anonymous this should work on all Realtek 8187L chipsets. Moreover, the procedure described here should work with all Realtek chipsets - just use the relevant drivers. Notice: /System/Library/Extensions/RTL8187L.kext has debug properties set. /System/Library/Extensions/RTL8187L.kext appears to be loadable (not including linkage for on-disk libraries). Can't load /System/Library/Extensions/RTL8187L.kext - no code for running kernel's architecture. Failed to load /System/Library/Extensions/RTL8187L.kext - (libkern/kext) requested architecture/executable not found. What OSX version do you have? First thing I might try is to load into 32bit by pressing the 3 and 2 keys at the same time during bootup. /System/Library/Extensions/RTL8187L.kext successfully loaded (or already loaded). Ok I just had to load the Realtek application and it works fine. Thanks! One question, do I always have to be in 32 bit mode to use the card? No not required - only during installation. Should work on your architecture. However you still need to load the kext everytime you need to use the card, followed by launching the Realtek application. I did an Automator workflow application. If you need the code just tell me. Hey. Thank you very much for this how to. Can you please post the Automator code? It works with OSX Lion 10.7 but only in 32 bit kernel. How can I get it to work in 64 bit kernel with a 32bit kernel extension? Boot up in 32 bit mode - i believe by pressing keys '3' and '2' while booting up. i'm running 10.6.8 and trying to install awus036H antenna. when following your checklist on step 5 when I enter the first sudo chmod line terminal asks me for a Password. The weird part is i can't even type mine in. I've even turned off my account password. okay disregard last, i figured out i just put in my password. I get "No kernel extensions specified". however if i type in /system/library/extensions/RTL8187L.kext it says it is a directory. This work on mac os 10.8? I'm using unibody polycarbonate macbook, which have Snow Leopard pre-installed. Was enjoying AWUS036H since early this year until yesterday I decided to upgrade to Mountain Lion. 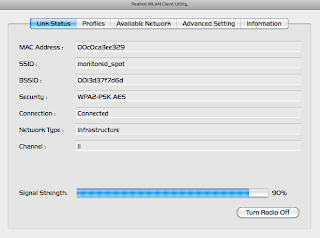 After the upgrade only I realized that Realtek USB WLAN Client Utility wasn't working as usual. I totally forgot about the driver which have issue with Mac OSX above 10.6 version. I will have a macbook pro soon (courtesy of the company where I work) - I will test and let you know. Any idea as to why my antenna becomes randomly disconnected? When it works I average around 90% signal strength. Help from anybody would be greatly appreciated. Thanks! Great help .. worked on second time i tried actually Step 8 was confusing i thought its 2 steps process but it was a single like script ..
Great discovery, thanks for sharing! Do you suppose this will work with osx 10.8? Mountain Lion will not start up in 32 bit mode but it is possible to right click an app > get info > select "open in 32 bit mode"
I'm hesitant to test it because I don't want to muck up kismac, but if this works, it would save me a lot of headache! Does this work for a powerbook running 10.5.8 and a awus036nhr? I've installed the driver from the alfa site. 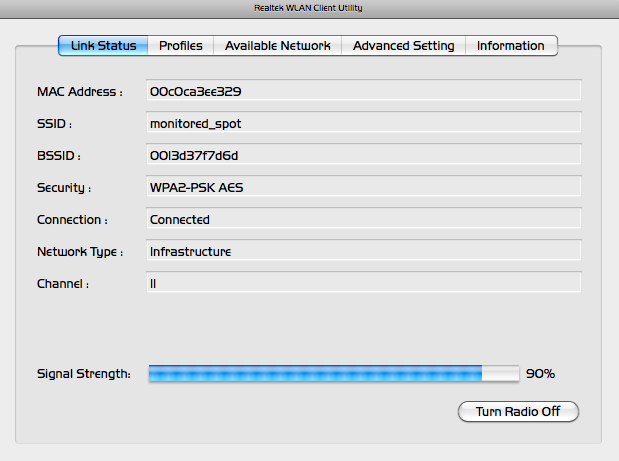 When the "wireless network utility" opens I get the message to enable the WLAN card. When I open network in sys pref the hardware is recognized as ethetrnet-adapter (en2). Can you give advise what to do?